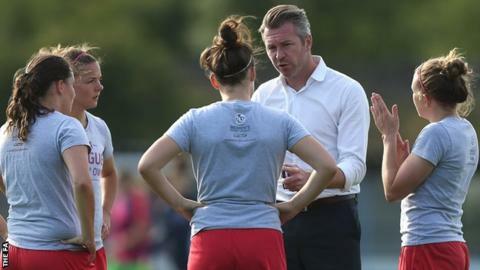 Manager Willie Kirk admits Women's Super League One relegation could see Bristol Academy lose half their squad. Bottom side Bristol host nearest rivals Birmingham City at Stoke Gifford Stadium on Saturday in a match the could shape the fight for survival. The Vixens are two points adrift of Birmingham at the foot of the table with three games to go. "My fear is that we lose the game, we get relegated and I lose half the players - if not more," Kirk said. "There is no point hiding the fact that it is such a massive game. "Everyone will have fears going into the game. It might be giving a penalty away, it might be missing a good chance, or might be losing a marker at corner. It is not a bad thing to admit what your fears are. "Players know how big it is for the club, it is a case of do we go with this budget or that budget? Obviously that affects them - are they at this club or are they looking elsewhere? "We are not trying to blow smoke up their backside to try take pressure off them. We have accepted that it is a hugely pressured situation." Bristol Academy and Birmingham City, who have competed in the Champions League twice in the past four years, now face the prospect of the drop. Birmingham, who were one of three sides that could have won the WSL 1 title on the final day of the 2014 season, reached the semi-finals in Europe last year. Bristol Academy beat Barcelona to reach the quarter-finals of Europe's top club competition this year. Birmingham City Ladies boss David Parker has previously labelled relegation "a doomsday scenario". The cost of relegation is £40,000 in Football Association funding alone, with WSL 2 clubs receiving £30,000 in annual development funds compared to the £70,000 backing given to top-flight clubs. Moreover, it is a case of less exposure outside of a top-flight competition building on the success of England's bronze-medal success at the Women's World Cup. "I have thought about relegation and what it means to the club," Kirk said. "As much as I don't want it to happen, it is not that scary a prospect. I'd rather rebuild the club in WSL 1, but if I have to do it is WSL 2, I will. "It has not distracted me, it has made work that little bit sharper and harder this week." Birmingham City beat Bristol Academy 2-0 in the Continental Cup at Stoke Gifford Stadium last week to secure a quarter-final berth. Bristol ended up doing enough to also reach the knockout stage of the competition as one of the two best-placed third-placed sides in the group games. Scotsman Kirk was appointed Bristol boss five games into the season after Dave Edmondson was sacked after just three league games, conceding 22 goals, scoring two, and having been eliminated from two competitions. Bristol goalkeeper Mary Earps says that the side that started their season with a heavy Champions League quarter-final defeat to eventual winners Frankfurt has got used to being written off as favourites for relegation. "People ruled us out really early," Earps said. "But we have got ourselves in a position where we still have a chance and we are just looking forward to this game now. "I don't doubt for a second that everyone on that pitch, everyone on the bench and everyone involved will be nervous. "But they will also be excited and that is what we are here for, the big occasion. Everyone is relishing it and we all can't wait." Who will win the WSL title race? Read more on Women's Super League: Who will win the 2015 title?